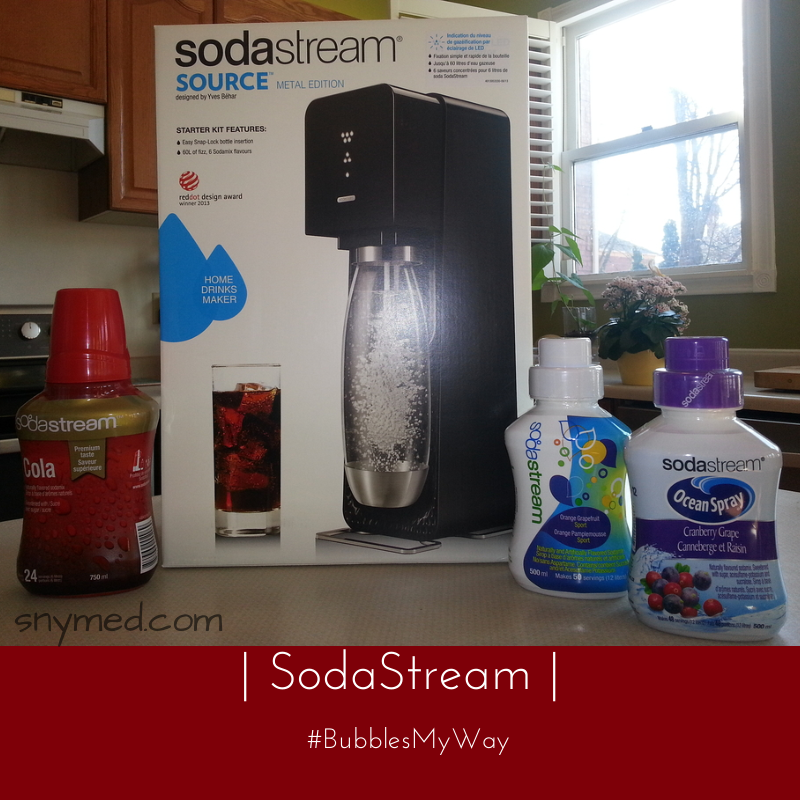 SodaStream Drink Maker Does #BubblesMyWay (VIDEO) & CONTEST (~OVER~)! When I grew up as a child in the 1970s, it was prestigious to drink flavoured beverages. If you owned your very own canned beverage, you status was similar to that of a celebrity--the image was just that powerful. Except in my household. Regardless that other kids and families were doing it, my mom would not allow flavoured beverages in our home. She believed that there was too much sugar in them. In that era, it was commonplace for families to have flavoured beverages with lunch and dinner. So for many years I felt quite "left out"--and in the heyday of flavoured beverages too! Decades later, it was time for me to set up my own household. From old habit, I still did not keep flavoured beverages in my refrigerator. However, my fiancé and (soon-to-be husband) was accustomized to a different way of life. And so it was agreed: we'd have flavoured beverages in our fridge periodically and on special occasions. Recently I was pleased to accept a SodaStream Brand Ambassadorship. It may sound unusual coming for someone who does not drink flavoured beverages regularly--and from the same person who preaches the virtues of eating (and drinking) well and staying active. 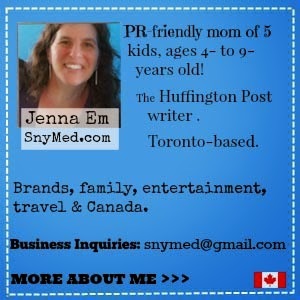 But let me tell you why I joined SodaStream as a #BubblesMyWay Brand Ambassador. Water is my favourite drink; it always has been, and always will be. I prefer it to teas, coffees, juices, etc. However, I love drinking sparkling waters! Infuse the water with lemon, lime, orange juice, cranberry juice, or puréed raspberries and I'm in heaven. Even better, the mixture I have described is a very healthful drink. I find that the SodaStream drink maker is excellent in this respect and very versatile--and allows me to make drinks on my own terms. 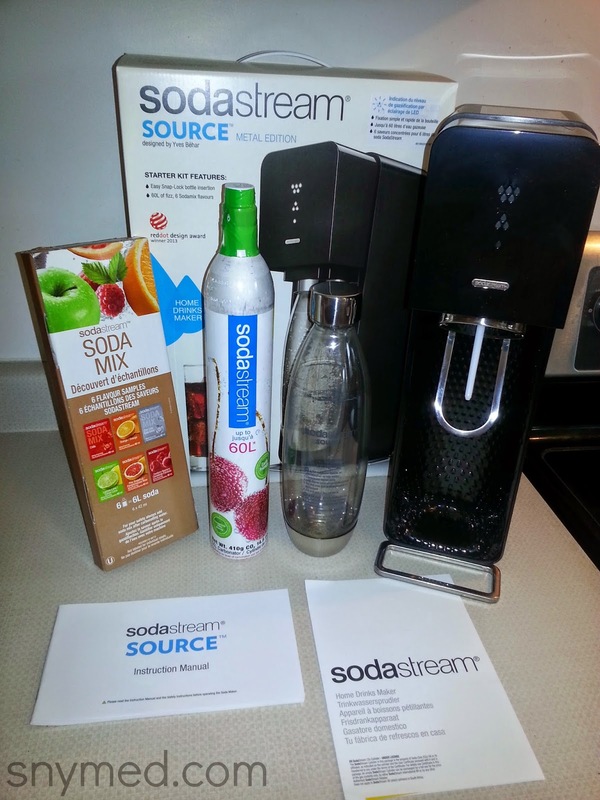 With SodaStream, I like that I can customize what goes into each and every drink. For example, I can add more or less carbonation, make the beverage sweeter or less sweet--and can even add my own fruit juice or puréed fruit to the drink. Hence their motto #BubblesMyWay. It Was Easy to Make This Cola With SodaStream! Hehe, notice my hubby drank some down! 2/3rd Less Calories & Sugar--and Less Carbs! I like that SodaStream flavours contain 2/3rd less calories and sugar--and less carbs than store-bought brands. This makes me feel better about serving it to guests at parties--and to my husband who consumes flavoured sparkling beverages. I also like that SodaStream offers over 30 tempting flavours from which to choose. It's impressive that 1 bottle of SodaStream can replace 2000 bottles and cans, which makes it an environmentally sound choice. Did you know that almost one billion bottles are produced each day, of which 800 million end up in landfills? I like that the SodaStream beverage maker is very easy to use, and was simple to teach my family members how to operate. My 8-year old makes plain sparkling water for the family as we run out, and he can do this in just seconds. It's that easy! 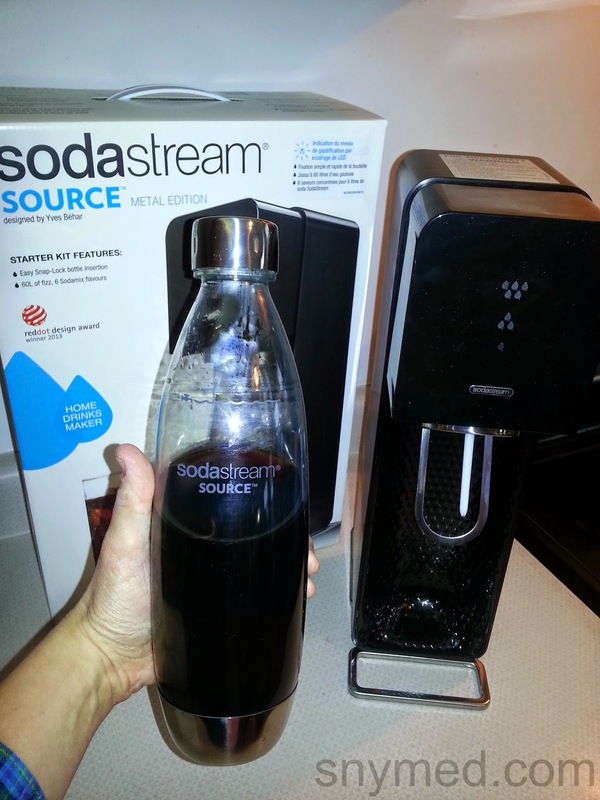 See my YouTube VIDEO demonstrating how to use SodaStream, HERE! "SodaStream is revolutionizing the beverage industry by empowering people with simple, creative, and fun ways to make and enjoy better-for-you sparkling drinks without all the bottles. SodaStream is a cost effective, eco-friendly, healthier and smarter option to other sparkling drinks on the market." Receive 15% Off a SodaStream.ca Purchase! Use Coupon Code PTPA to receive a 15% discount off the purchase of a SodaStream drink maker, when you make the purchase on SodaStream.ca! Discount code good online only, and not instore. WIN 1 of 7 SodaStream drink makers (including 1 drink bottle and 1 C02 cylinder) from SnyMed.com, PTPA and SodaStream! Colour of prize to be chosen at random. You may enter contest on multiple blogs, but may only WIN one prize. Contest open to Canada (sorry Quebec). Ends Wednesday April 30th, 2014. Leave a COMMENT below stating the specific flavour of SodaStream drink you would like to try the most (see SodaStream drink flavours HERE). Then use the entry form to enter the contest, below. GOOD LUCK! I love to drink too much soda so it would definetely be the Cola I would try first. I drink way too much soda, so it would definetely be the Cola i would be trying first. I try to get my kids eating healthy but it doesnt go over so well, i do get my kids involved in recyclying in our house though. Pink Grapefruit top of my list to try! We recycle as much as possible, have a garden in the summer and compost to try our best being eco-friendly! Recycle and we try not using plastic bags form anything or baggies for lunches. We try to eat raw as much as we can...fruit, veg and remain physically active throughout the year. My kids participate in both winter and summer sports. Yes, I'm that crazy hockey mom lol! I would love to try cola or diet cola. I would love to try cola or diet cola. The lemonade one also looks good. I'd love to try the diet root beer! We always recycle and reuse items that are not recyclable whenever possible. I am lucky my kids love to try new things and enjoy eating healthy. I would like to try the Sparkling Teas! The Orange Mango looks delicious !! I would love o try he strawberry (for the kids). We recycle as much as we can, pack containers in the kids lunch instead of plastic bags. I try to avoid junk food as much as possible! I would try the sparkling teas. buy local and organic. non gmo wtg! we have our own garden. We process our own foods with canning and dehydrating. No additives ! Fantastic post, Jenna! Loved the video! Pink Grapefruit is my favourite flavour! Thanks Carol! My nephew also likes SodaStream's pink grapefruit. Reuse as much as possible.Cloth bags are a favourite. we recycle, reduce and reuse whenever possible to be more eco friendly. We also grow our own food too! Reuse things first, and recycle when it can't be re-used for anything else. I think the key to eating and drinking healthy is staying away from processed foods and eating lots of fruit and veggies as well as fibre. We drink tap water and have are own vegetable garden. Just eating more fruits and veggies! would love to try pink grapefruit. as a family we try to eat as much fruit / veggies as possible and we are always sure to recycle and reuse anything we can. We recycle, and turn old clothes into rags, or yarn. I recycle anything I can. We use reuseable containers to take veggies and dip to school for lunches. I recycle everything that can be done. I'd like to try the COLA. How it compares to Coke and Pepsi. A lot of cans and plastic bottles in our blue bin. We've changed all our bulbs to LED! And we compost everything! I'd want to try the Crystal Light Lemonade first! I make my own lemonade and juices. We try not to create excess waste. We also try and reuse what we can. WOW!! Would love to win this always wanted one!!! Instead of buying all of those individual bottles of water, I now use refillable bottles and a filter jug, it's much cheaper and better for the environment. I like the taste of Pomegranate so that's the one I would have to go with. I recycle and buy in bulk . Would love to try the grapefruit one .This would help with not buying soda so less bottles in the dump. We stopped buying bottled water and we plant a veggie garden in the summer. We have switched to filtered re-usable water bottles. Would love a Soda stream to so we stop using cans and bottle pop! I try not to use plastic sandwich bags , we use containers. I try to always cook and bake at home. I know what goes into it and it always tastes way better! I love the ginger ale! Shopping smart is one of the main things I like to do.Buying fresh veggies and whole grain breads.Just making healthy food choices for my family is important. Not into organics but there are so many options out there.Not easy at first,but then you get use to the foods on how to buy and where to buy.You get into the routine quickly. We also recycle and compost and it actually gets enjoyable when everyone pitches in.Again,it was not easy the first time,but now its clockwork. We always use cloth shopping bags for purchases & I also bake treats with beans, chick peas, etc for a healthier lifestyle. we recycle and use refillable water bottles. we also try to eat healthier choices. Always try to eat what comes from the ground. Especially during the spring/summer, by local fruits and vegetables! Eating anything from the ground that we can and always buying local fruits and vegetables in the spring/summer! We recycle whenever possible, and we bring our own bags to use when shopping. Try to eat healthier snacks. Instead of potato trips, try to have a granola bar. We only eat fresh produce, nothing that is processed. We focus on water and adding fruit to it or watering down 100% juices with water. I use an organic local delivery company. I love having healthy food and eco-friendly products delivered right to our door. Would love to try the Kraft or Fruit flavored drinks! as much organic as possible, subbing veggies for salt-laden snacks! We try not to eat anything with ingredients that my grandmother would not have used. We try to buy local fruit and veggies whenever possible. I think I would like to try cola. I would like to try the Dr. Pete and the cherry cola. We try to recycle what we can and use filtered water. Lemon Lime how it compares to the brand name. We try to drink water instead of soda and fruit instead of cookies. I`d love to try the Cream Soda first. I never buy bottled drinks but remember enjoying them as a youngster. I recycle everything that I can, I compost, I don`t buy bottled drinks at all. I never buy ready made meals, preferring to cook myself so that I determine what`s in my food. We try to eat organic as much as possible and use a water filter instead of bottled! I would like to try the fruit. This would be my way of making eco and healthy choices by cutting sugar in my sodas. I bring re-usable bags to the grocery store. Green Bin & Recycling Bin ALL THE WAY. Pink Grapefruit would be so refreshing!! Pink grapefruit! I buy it fresh sqeezed and it's pretty expensive, would love to try making it mysef. We always have fruit around. We refill our water bottles. we cloth diaper, try to buy whole food instead of processed, and make our own cleaners. I use a refillable water bottle! We grow our own organic vegetables in the summer. We are really conscience about what we are throwing out into the garbage. We LOVE to recycle and are very careful about not putting the "wrong" things in the "wrong" garbage. Also, we are careful to not throw batteries into the garbage. The sparkling tea sounds awesome. I'd try that one first. We try to eat healthy and less processed foods. I like to try the Country Time Lemonade. I'd like to try the Cola and the Lemon Iced Tea. We drink a lot of water and we use a filter and reusable water bottles to reduce waste. i'd try anything like cola root beer etc. Pop is almost extinct in our home. It took a while to teach my family that pop is a treat, not an essential. Love to limit the sugar the kids get! this sounds great! We eat healthy and exercise as much as possible. We recycle .......everything. I've also switched to using a travel coffee mug rather than all the drive thru take out cups that I was using before. I would probably like to try the cranberry-raspberry. we walk everywhere or take a bus if the weather is really bad. it makes us healthier and reduces the pollution. We recycle like crazy and buy used products when possible. We look for minimal (or no) packaging and I'm trying to learn to garden. I like to try the Goodness Black Currant Pear in the Natural line of Sodastream syrups. We are natural in our way of lack of conventional medication we use the land and veggies. We grow our own vegetables and fruit and try to buy the rest locally through farmers and farmers markets, we use a clothes line to dry our clothes, we compost, recycle. We cloth diaper. I have a large herbal garden for homemade herbal remedies. We don't buy bottled water. We eat little to no processed food, everything is from scratch in our home. We buy used when possible for clothing, etc. We spend a lot of time outside hiking and camping and teaching our children a love of the outdoors and nature.